No matter how good your product or service is, without sales (and sales skills) your company will not survive. Sounds simple enough but sales can be a tricky business for start-ups. Entrepreneurs would love to subscribe to the business maxim, “If you can’t do it, hire someone who can.” But they may not have that option. So in lieu of having funds to hire a full-time salesperson or team, the entrepreneur must often build sales skills themselves to find and close that all-important first customer. They must not only learn how to sell, but how to open doors to sell new technology, which is much more difficult than selling technology from an already credible company. Here’s where a MaRS Advisor with sales expertise can help. 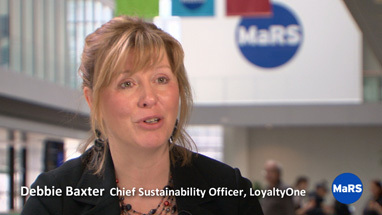 Last week, Debbie Baxter (Chief Sustainability Officer at LoyaltyOne) delivered a Best Practices session on Effective Sales and Business Development where she drew on her years of sales experience to give the audience an overview of all aspects of the sales cycle. In her work with entrepreneurs, she has found that the common mistake entrepreneurs make is not clearly defining their value proposition or focusing too much on their technology and not enough on how their technology solves their customer’s problems. She talks about how to overcome these problems and more in the video, 5 hot sales tips for start-ups. Her full presentation on sales and business development is available to watch here. MaRS has got articles, blog posts, videos and workbooks that will answer your questions, tagged with “sales”. 5 hot sales tps for start-ups from MaRS Discovery District on Vimeo.